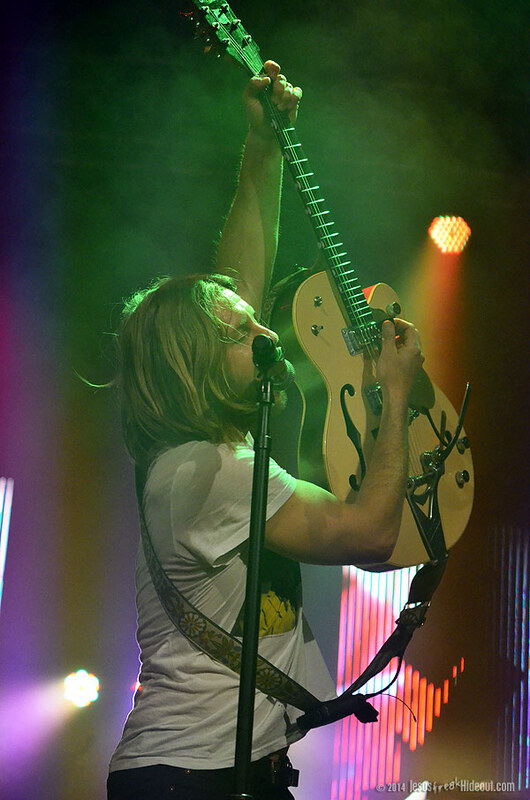 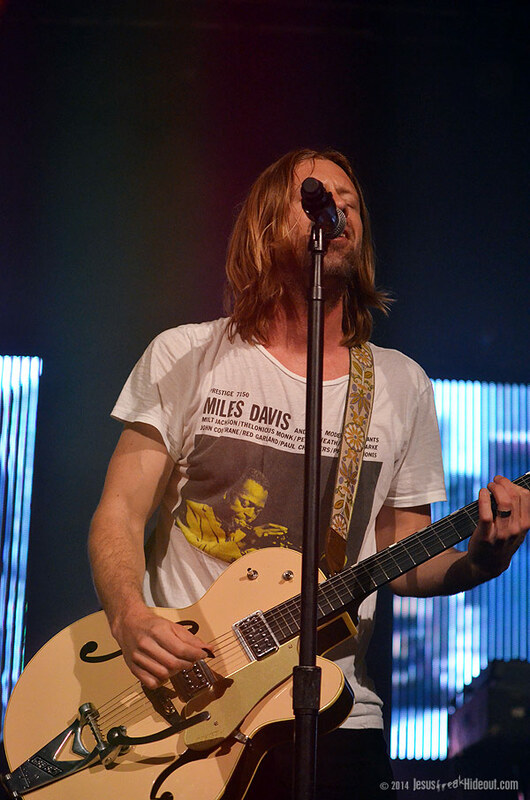 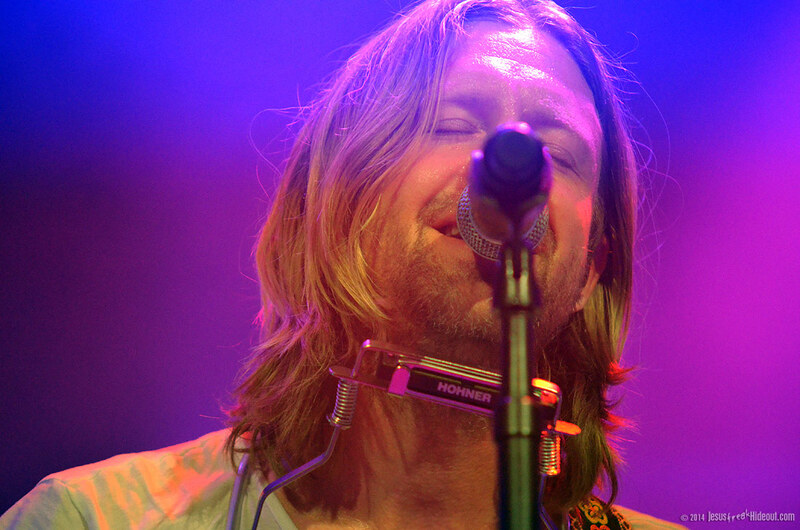 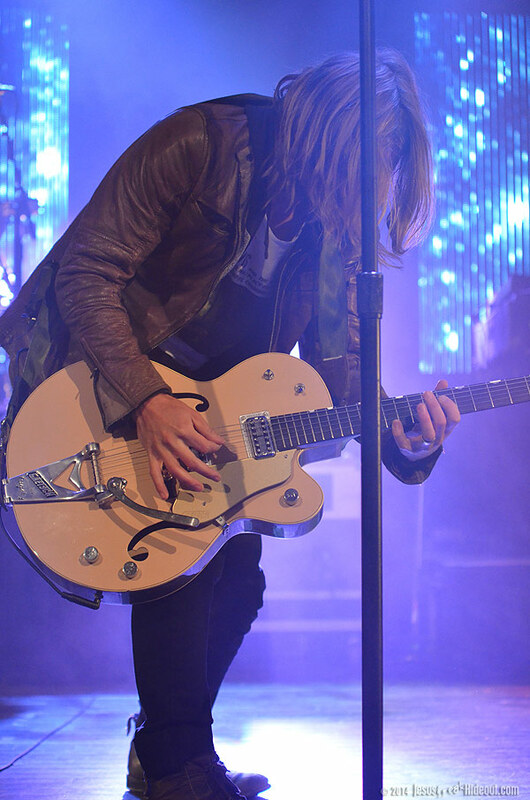 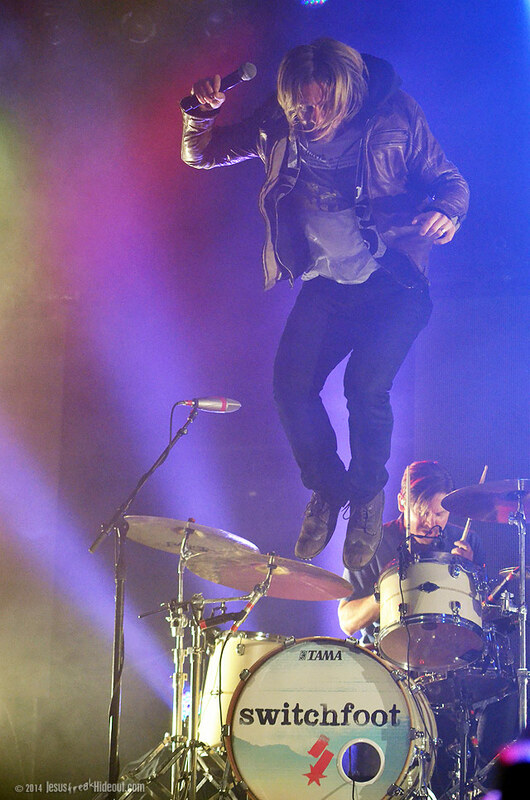 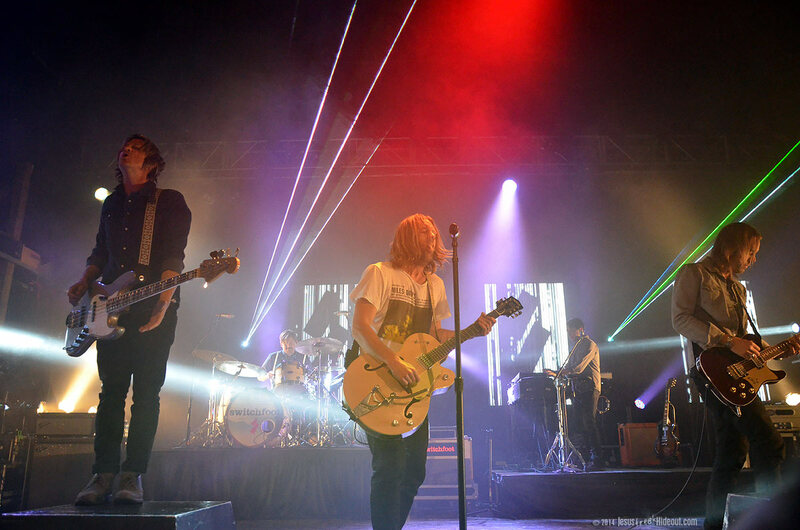 On an especially arctic spring day in March, the Switchfoot "Fading West Tour" rolled into Stroudsburg, PA. For this particular tour, Switchfoot has been playing cuts from their brand new studio album, Fading West, for the first time, plugged in for a full-on rock show. 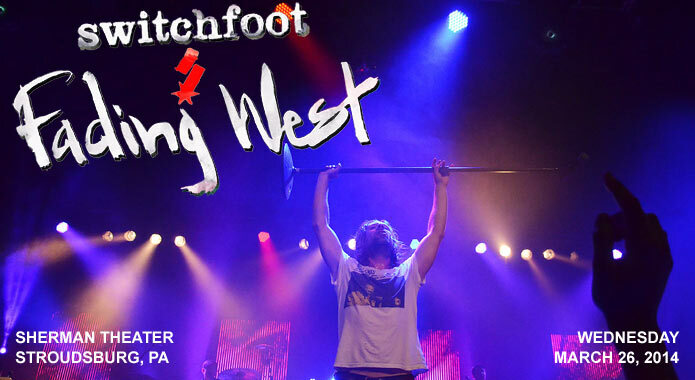 For the Fading West Tour last fall, the guys showcased their new feature film of the same name before playing an abbreviated acoustic set. 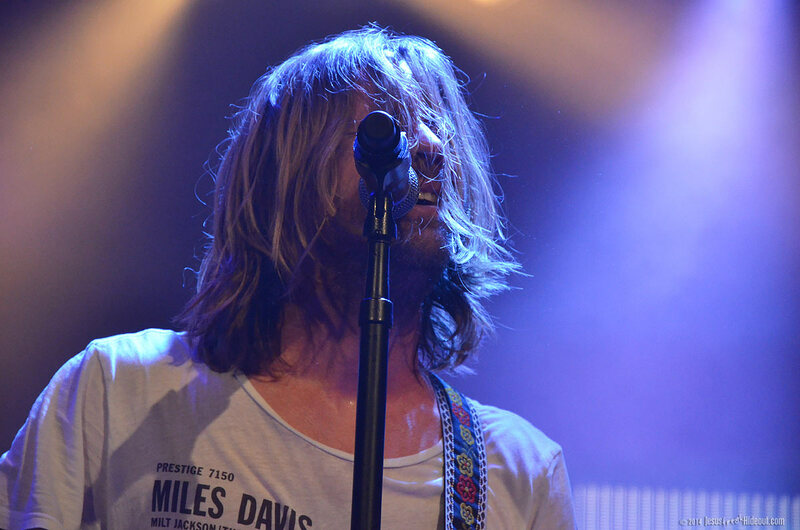 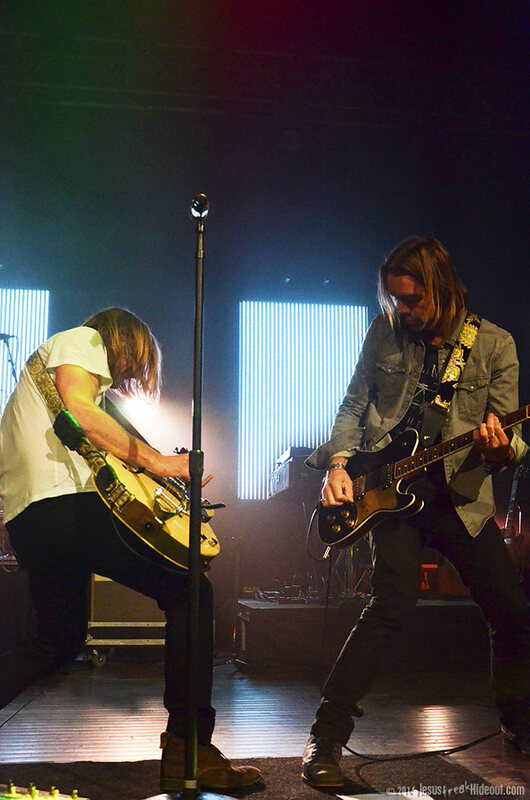 That tour also featured no other artists on it to support them, but this time around, Switchfoot has Swedish mainstream pop act The Royal Concept in tow. 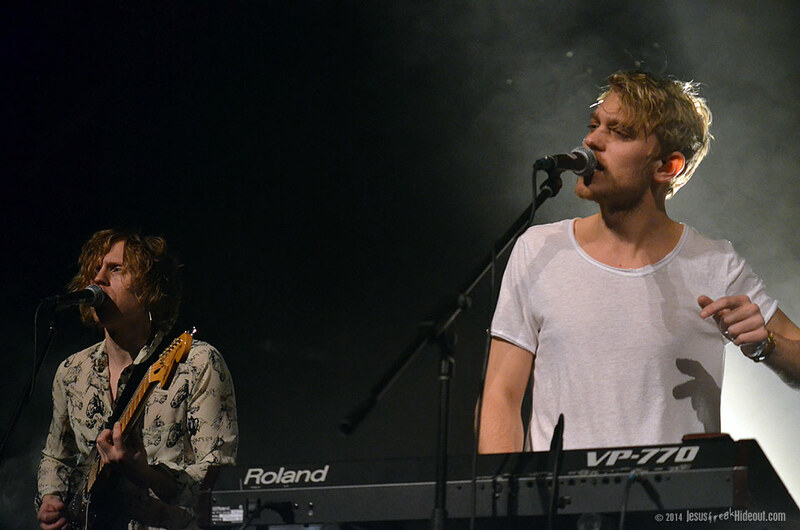 When the show started at 8pm, The Royal Concept emerged with a catchy electronic pop song that stylistically fell somewhere between Jonezetta and Paper Route, creating catchy melodies and audio textures that were just fun to listen to. 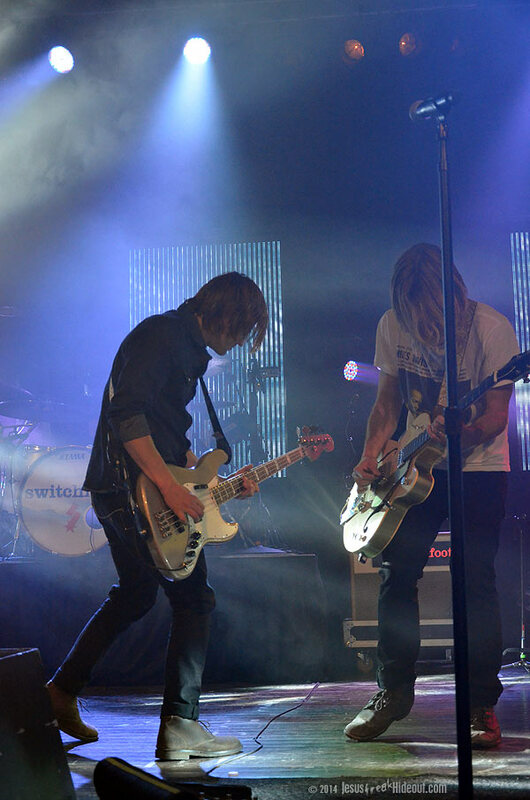 It wasn't hard to get into their infectious sound. 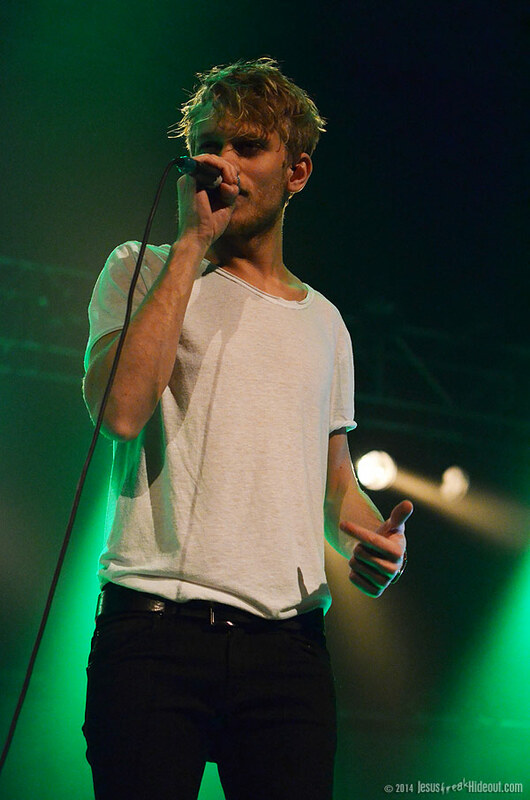 However, even with ear plugs in, I had trouble being able to hear the words that vocalist David Larson was singing. 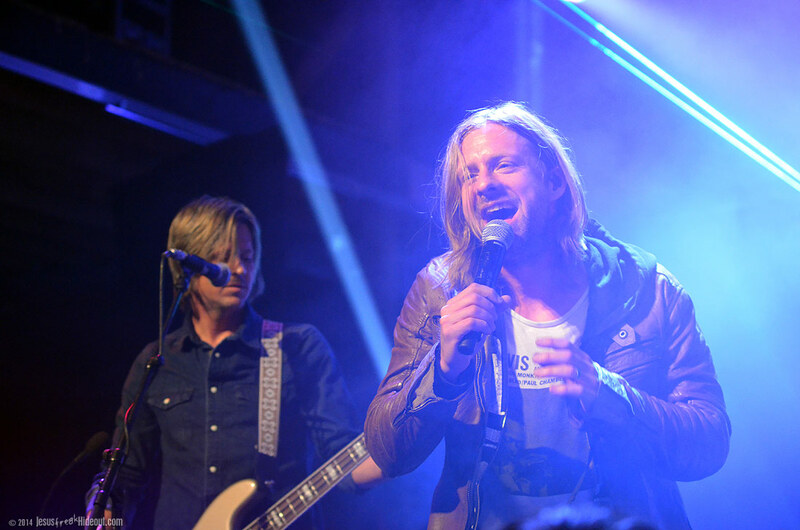 Except for a few highly singable choruses from songs like "World On Fire" and "Shut The World," it was tough to make out what the lyrics were. 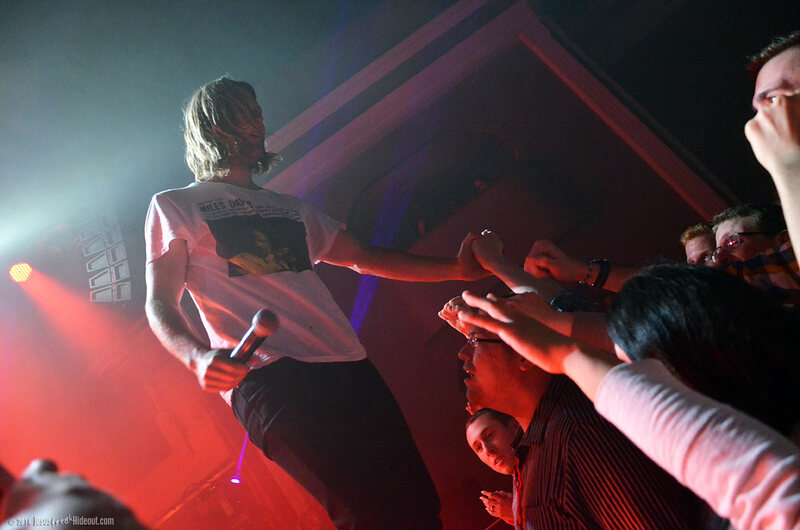 And, in actuality, that was a plus for my personal experience with the band's music that night. 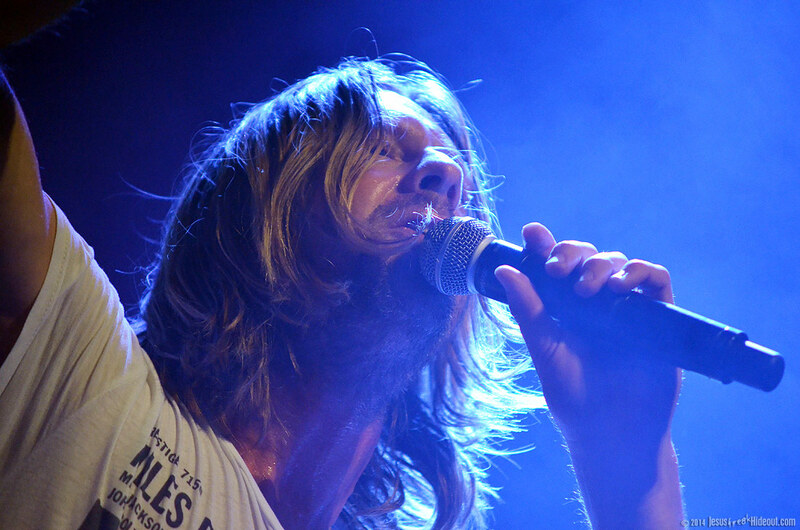 While I realize lyrics aren't super important to every music listener or fan, they are for this particular reviewer, and upon looking up their EP Royal the day after the show, I was a little surprised (and disappointed) to realize how much of it was either sexually suggestive or riding the line of that. 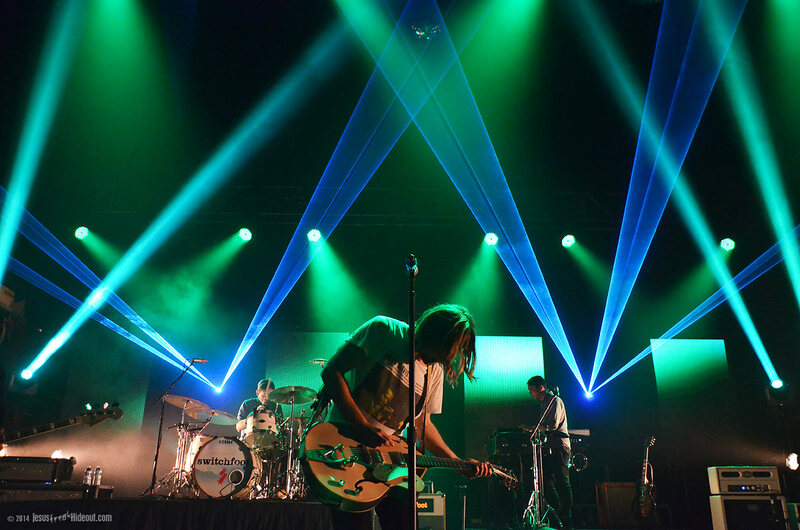 And, in the end, it felt like the lot of the lyrics were adding up to not really saying much substantial at all. 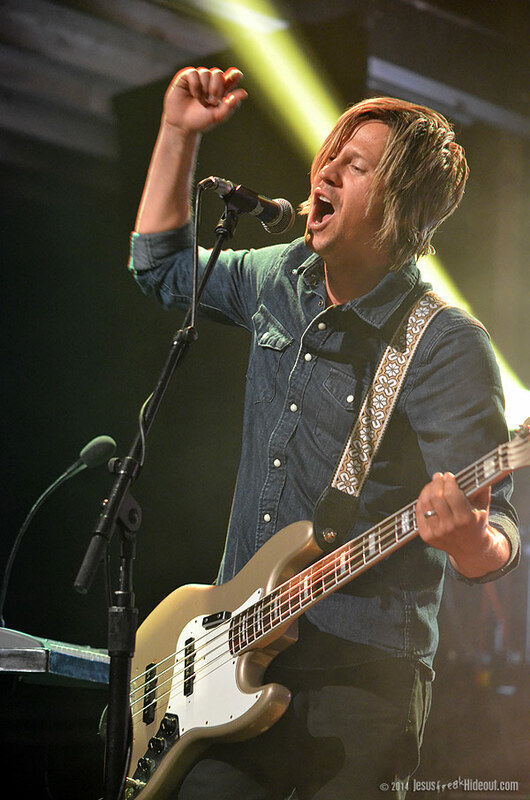 And this is a distinctly stark contrast to a band like Switchfoot, who, arguably, can inject tangible passion and inspiration into even the most simple lyrical idea. 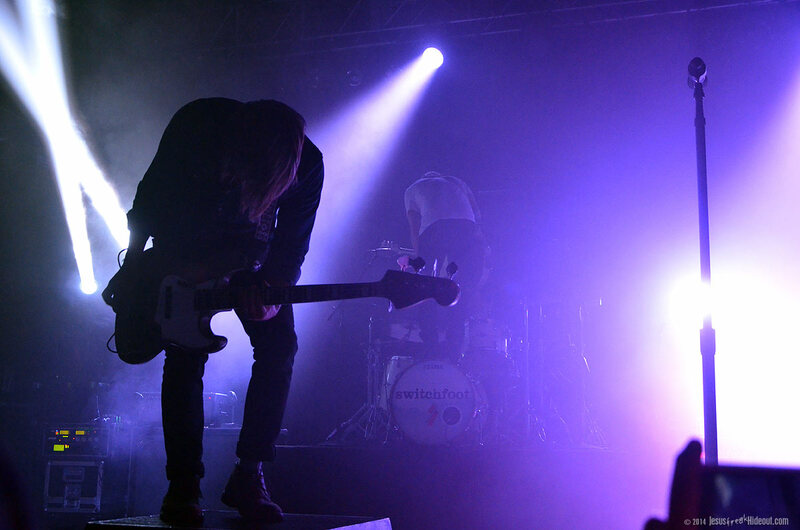 So while The Royal Concept was a pleasing opener from a musical standpoint, they sadly offer very little than an ear-pleasing sound. 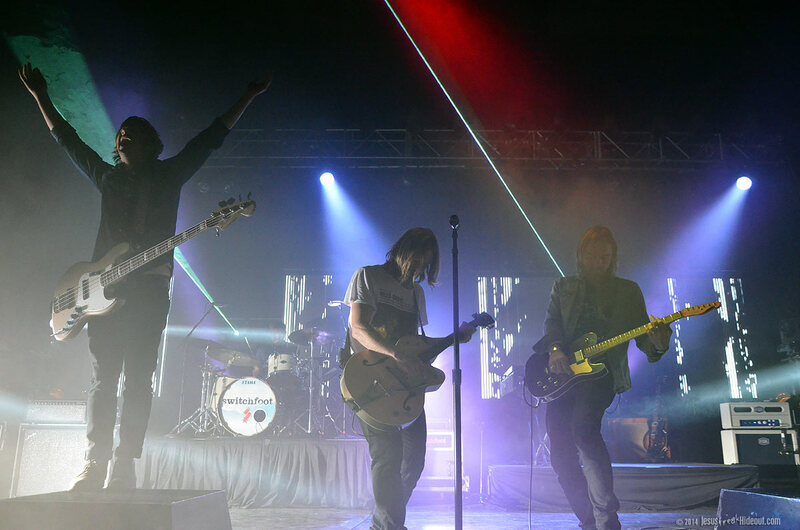 After a lengthy opening set, which really complemented the musical vibe of Switchfoot (like a good opening act should), a 15 or so minute set change followed before Switchfoot's nearly prompt 9pm start time. 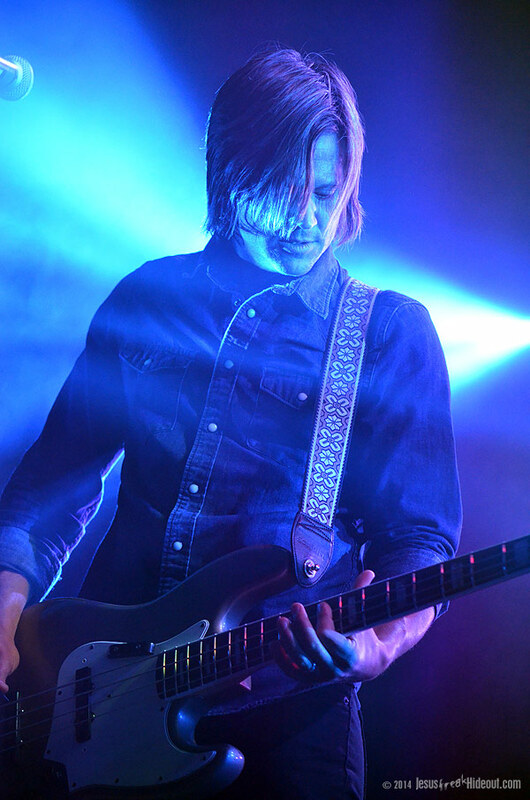 And to the sound of deliciously fuzzy guitars, Stroudsburg was hit with the rocker "Say It Like You Mean It" from their latest album, Fading West. 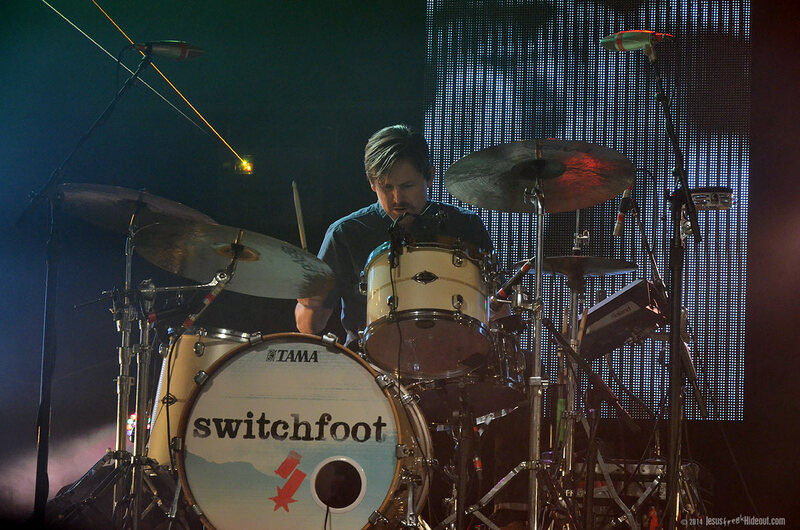 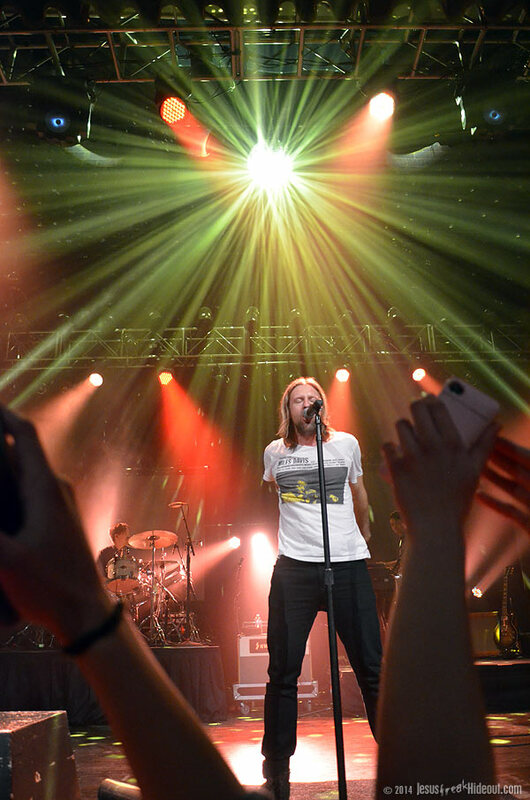 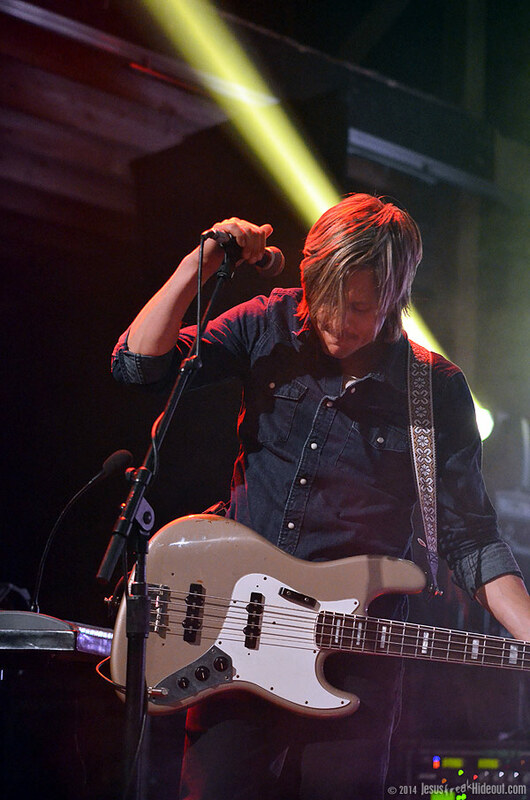 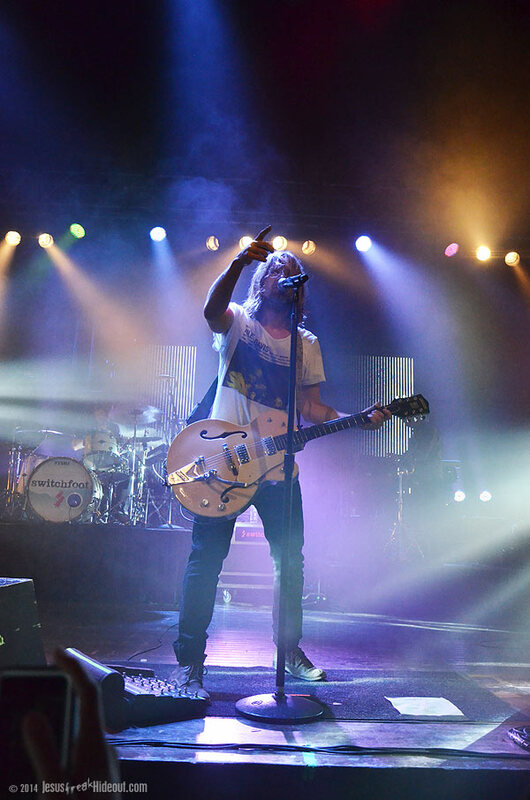 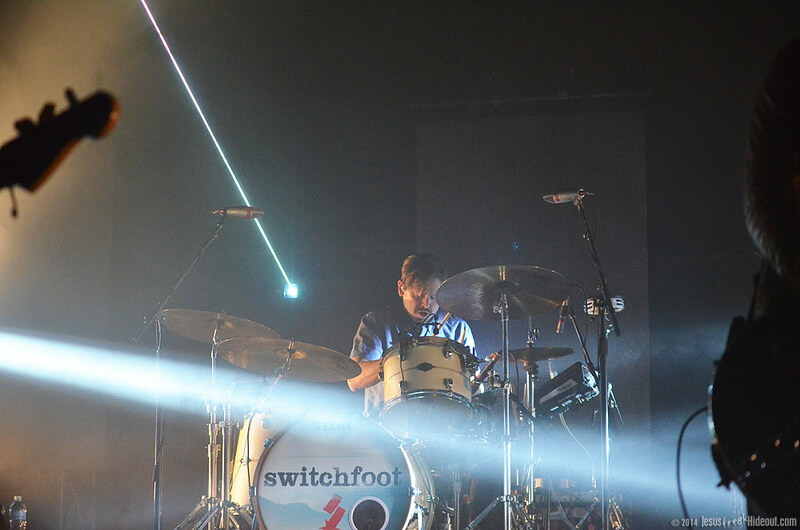 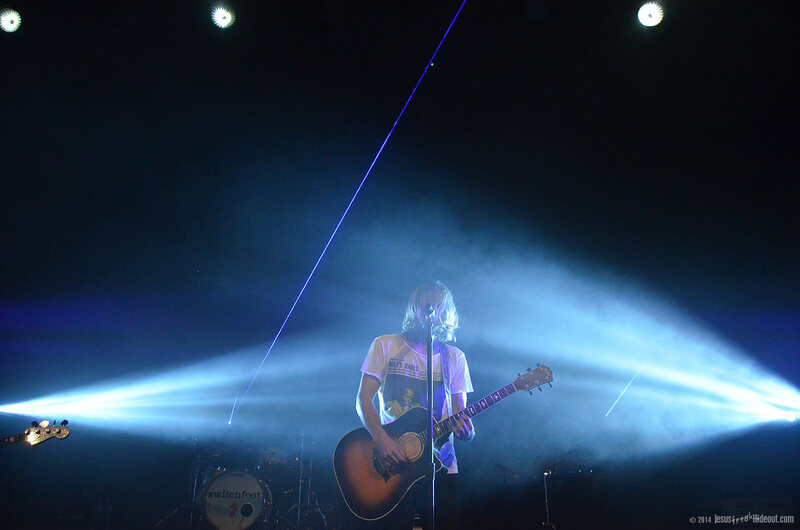 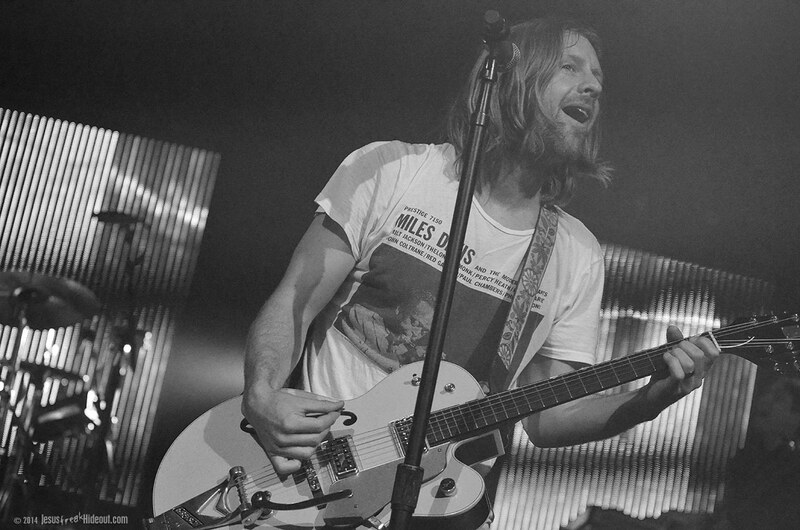 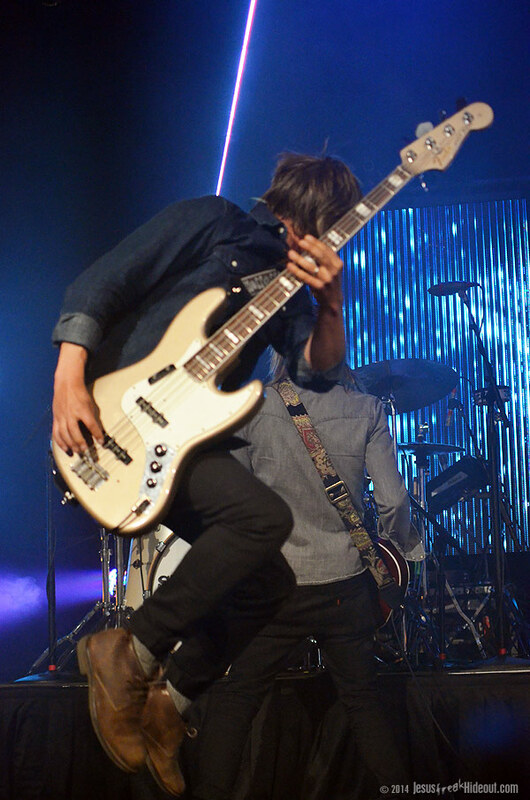 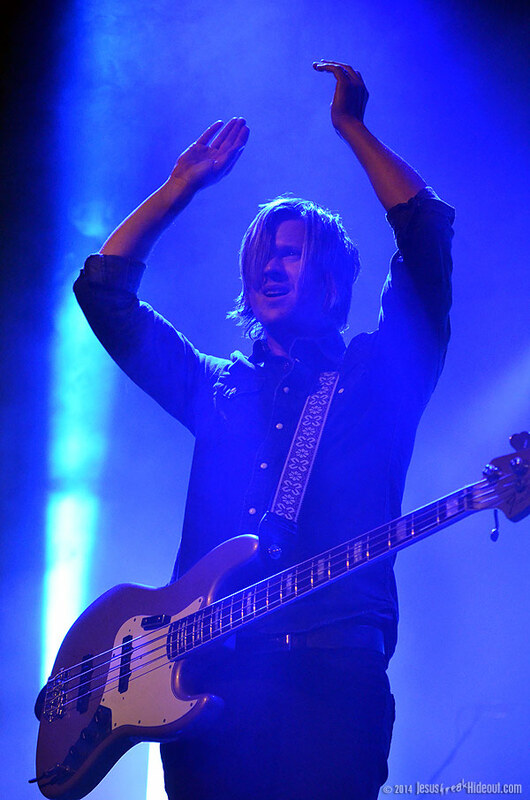 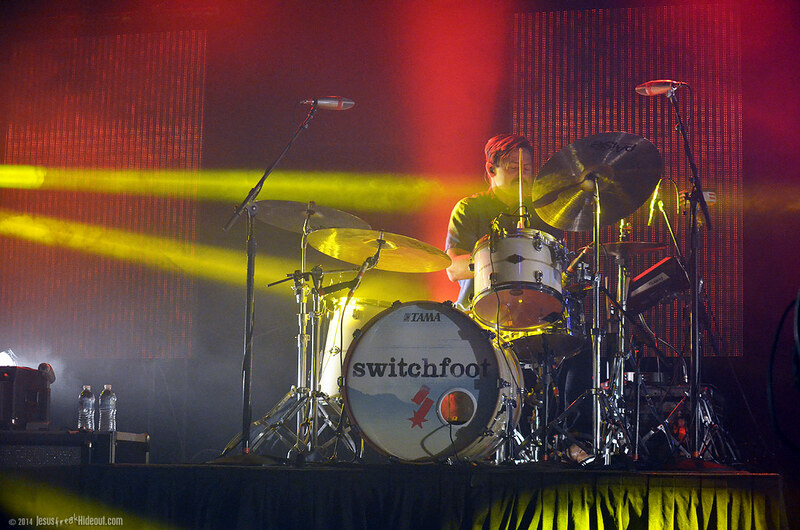 For this tour, a pair of laser lights were set in the back above drummer Chad Butler's set, and several other placements of lights lined several areas of the stage, creating an excellent accompaniment to the Switchfoot soundscape. 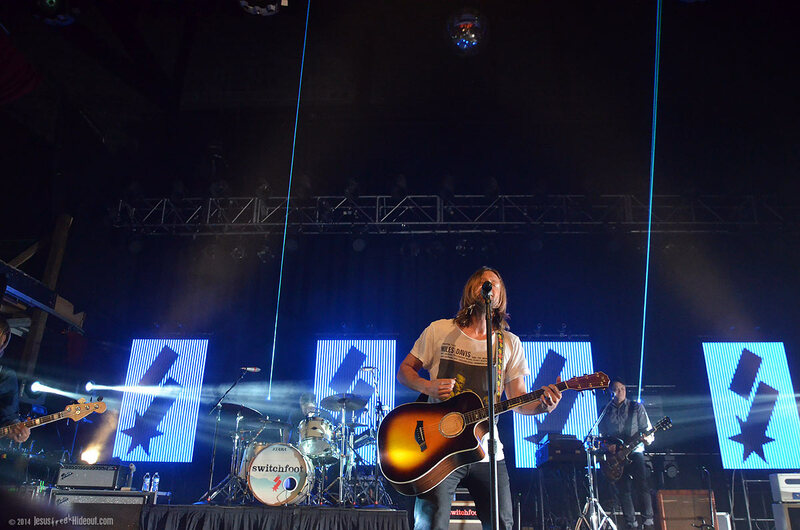 Four or so video screens were hung in the back too that would show either pieces of the Fading West film, scenery, or graphical designs. 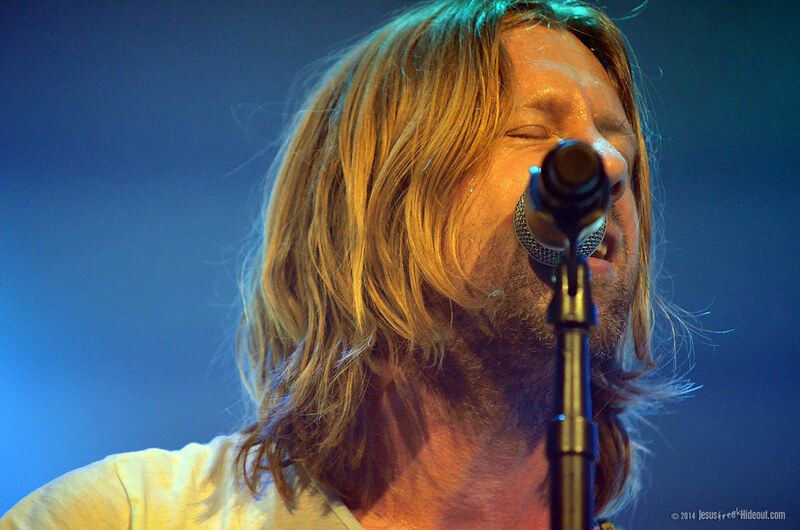 "Stars" swiftly followed, a truly standout Switchfoot anthem that never gets old. 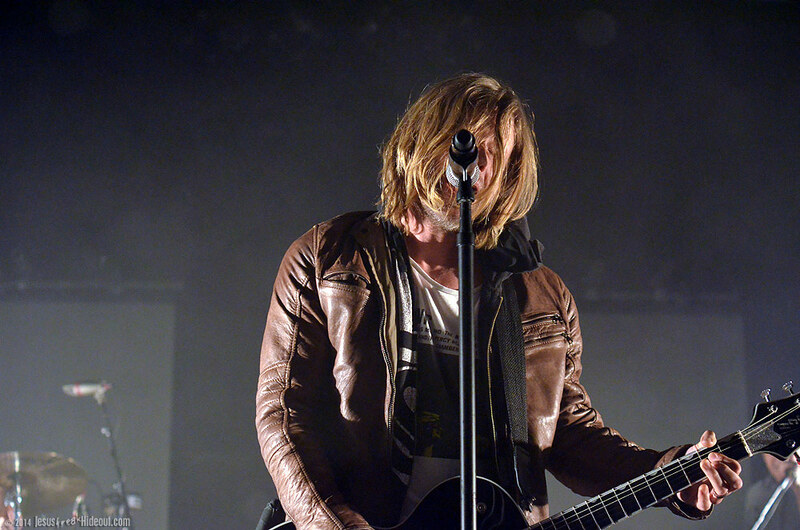 Frontman/vocalist/guitarist Jon Foreman stepped out from behind the mike briefly to stand atop a speaker and encourage a singalong with the audience. 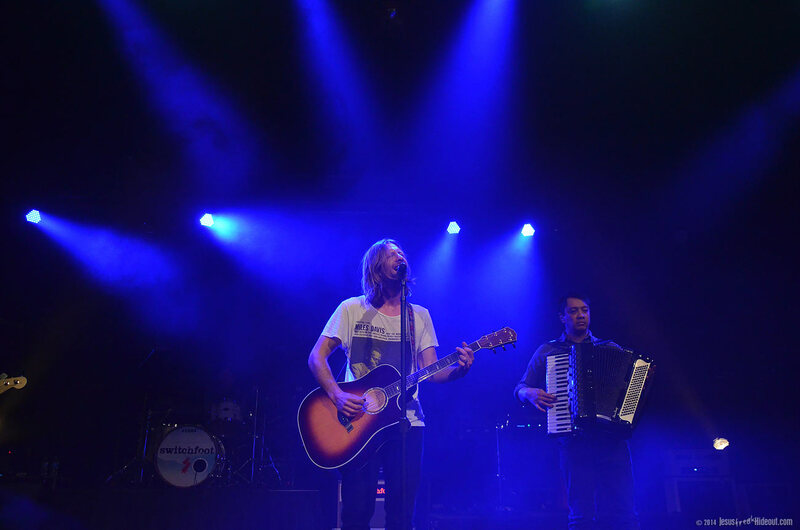 Foreman has made engaging with the audience nearly an artform--something that other artists have since emulated (including Tenth Avenue North), but can't do it quite as effectively as Foreman seems to. 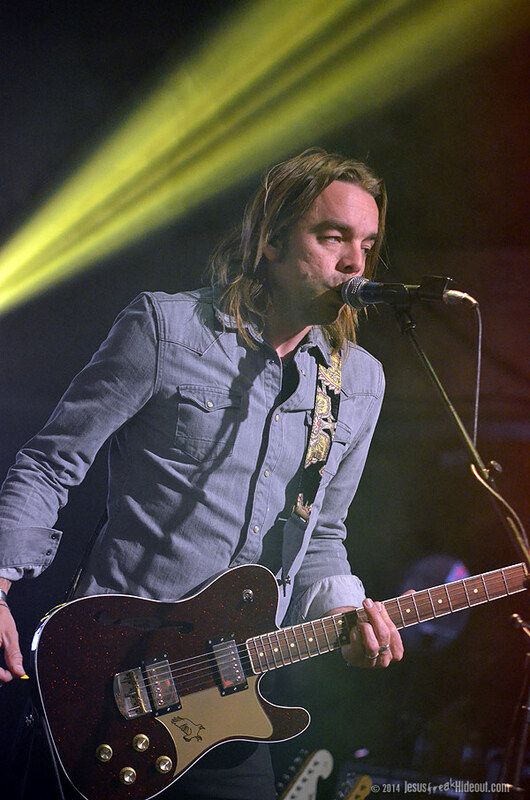 Sticking with fan favorites, "Gone," from their breakout album The Beautiful Letdown, followed and then Foreman tossed his jacket aside and addressed the Stroudsburg audience. 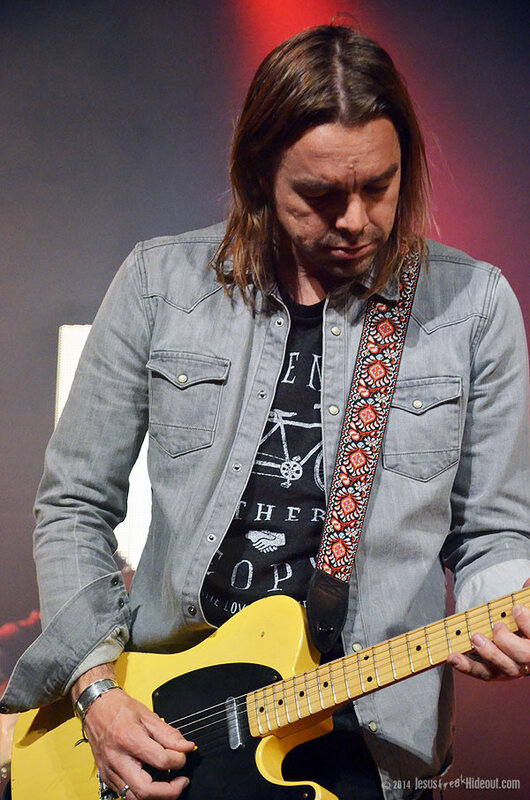 "Who We Are" from Fading West was an appropriate follow-up, and then Jon joked about how this was supposed to be their "Spring" tour, yet the weather has been anything but showing signs of spring. 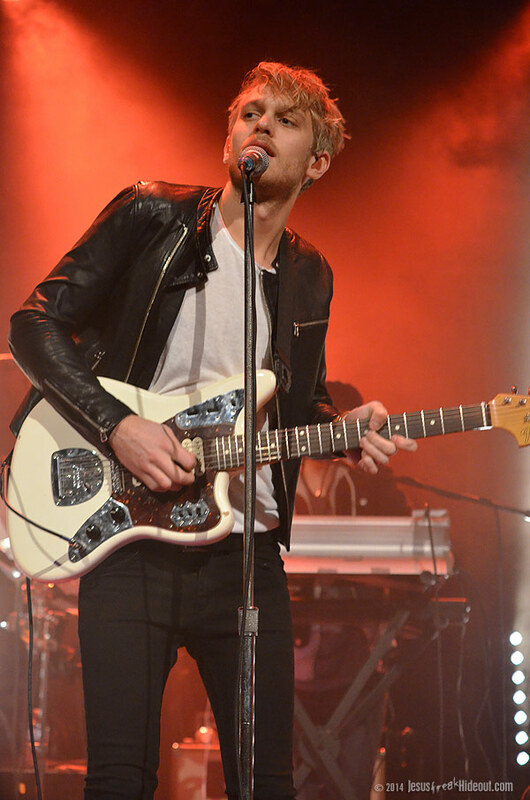 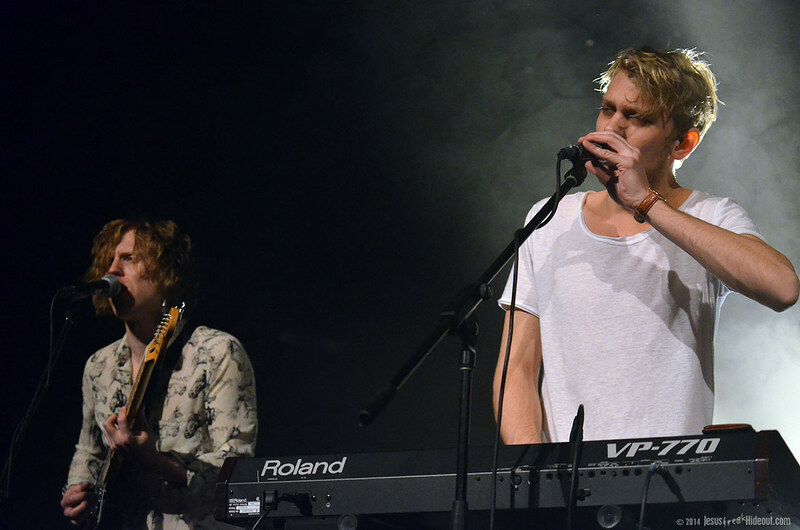 He dedicated the song to the saltwater and warmth of San Diego and launched into another new one, "Saltwater Heart." 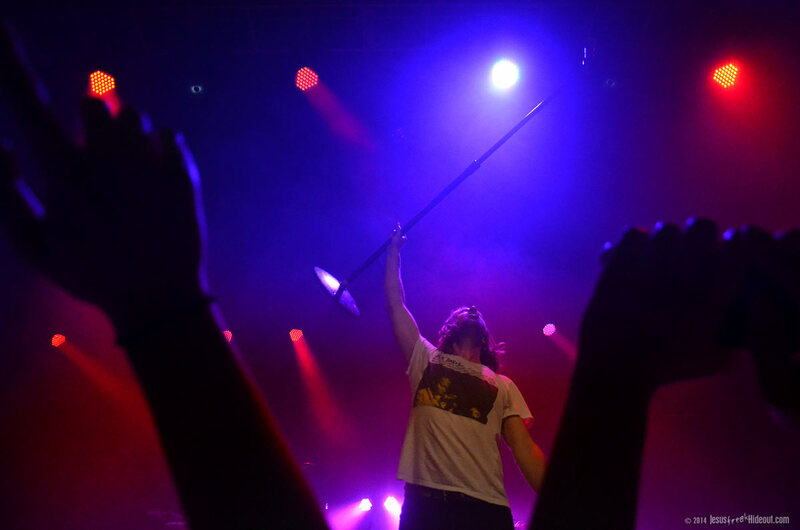 By the end of the song, Jon hopped off the stage and stood on the metal barrier that separated the audience from the photo pit and sang along with the crowd. 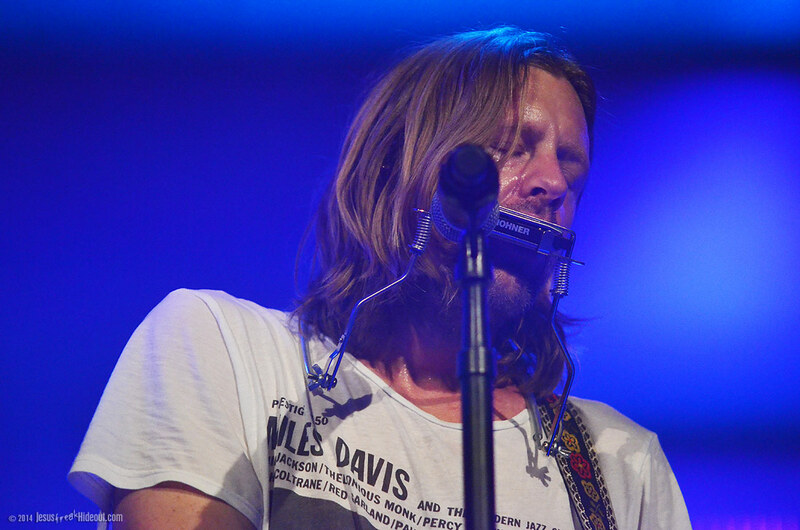 After returning to the stage, he donned a harmonica strapped around his neck for "Your Love Is A Song," the only real ballad of the night. 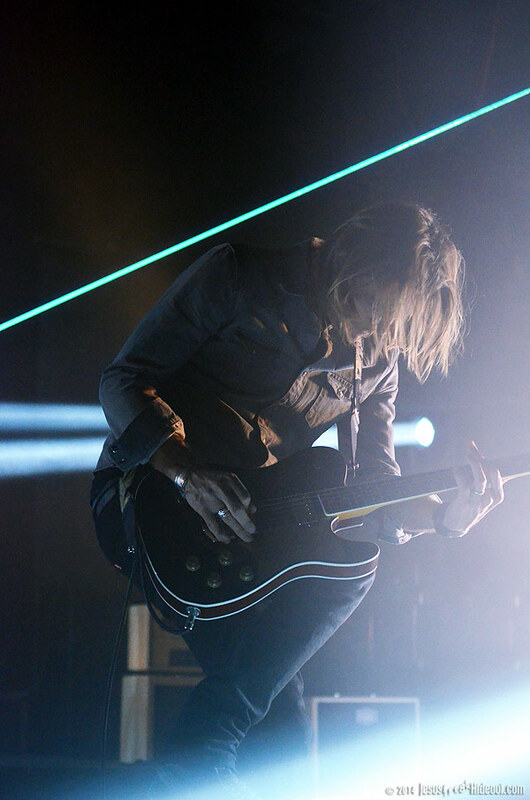 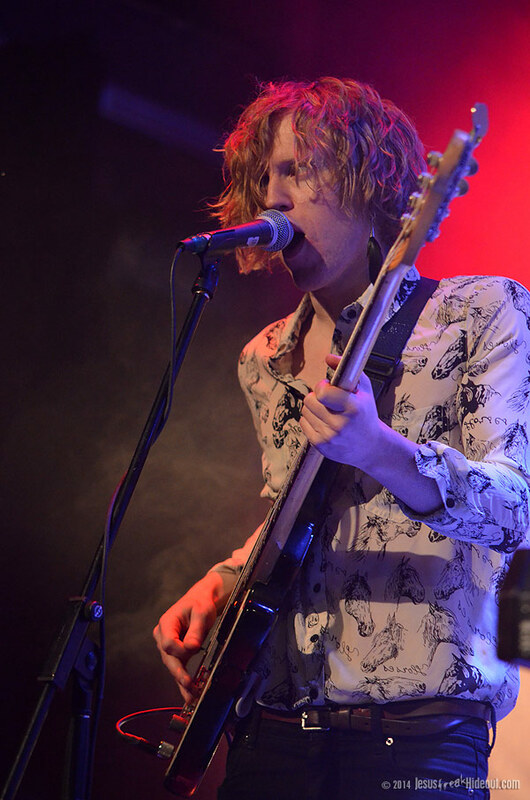 Near the end of the song, guitarist Drew Shirley offered a truly chilling guitar solo that isn't part of the original song to really take it to a new level entirely. 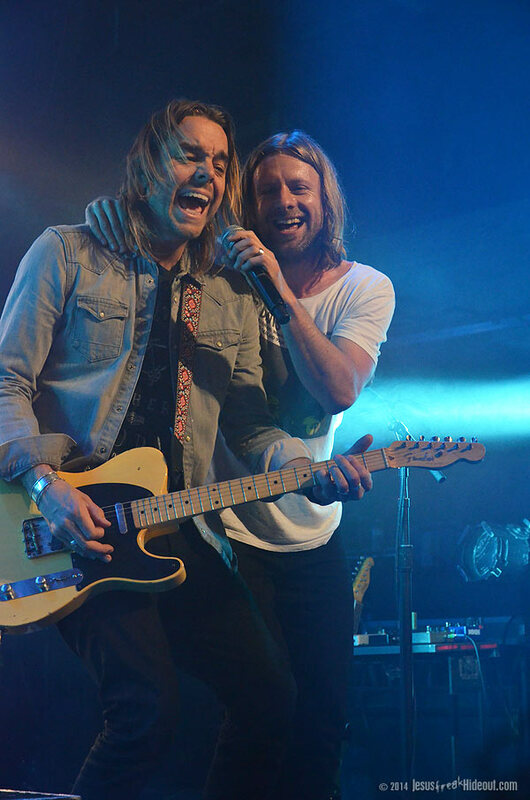 It was such an incredible moment in the set that I'd love to hear Drew just let loose or riff freely more often. 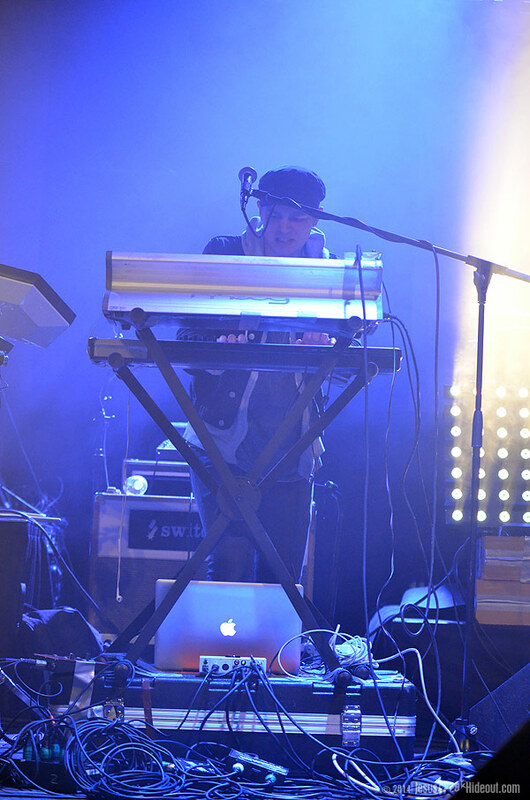 At this point, keyboardist Jerome Fontamillas stepped out from the back of the stage with an accordion to join Foreman down front. 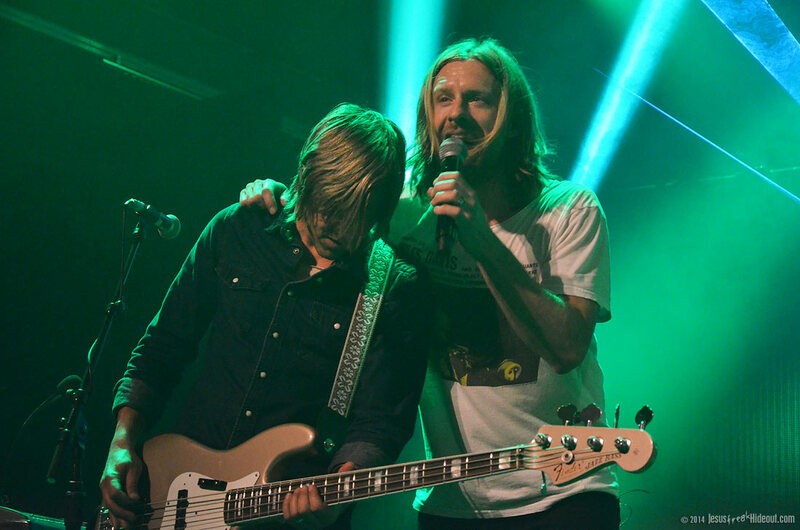 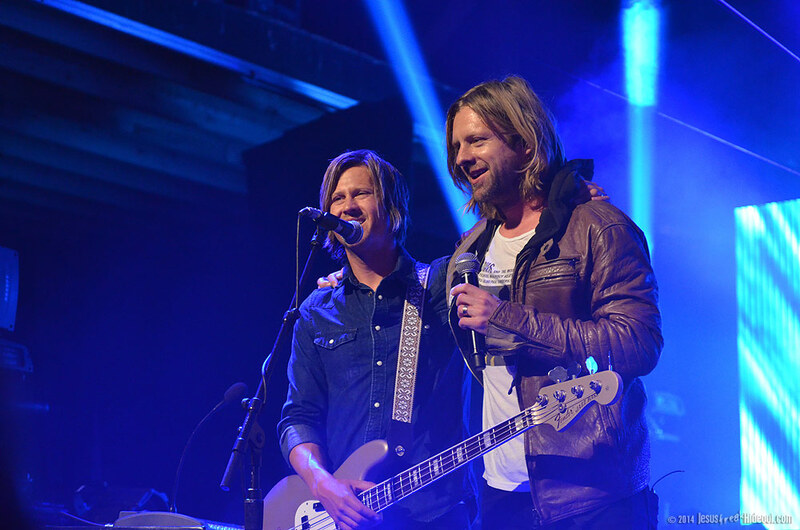 Jon talked about writing the next song after dropping out of college and then the twosome began to play a stripped-down version of the staple Switchfoot hit "Meant To Live." 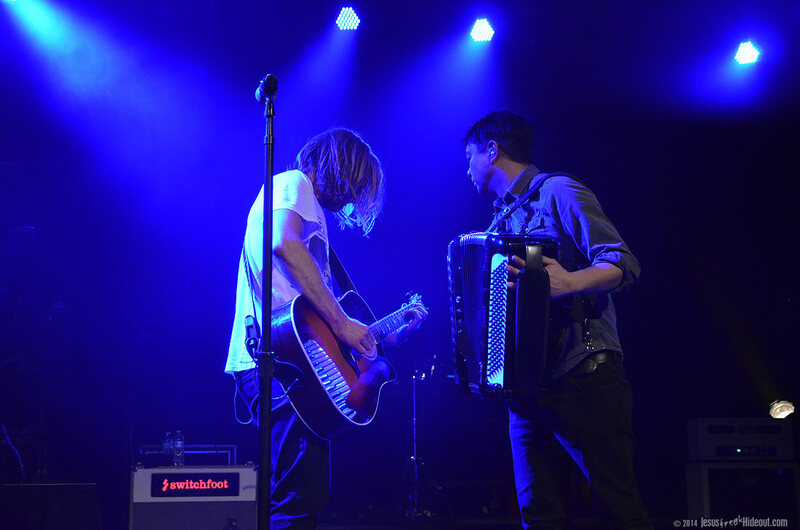 But fear not fans who paid hard-earned money to hear the song live the way you know and love it; before the end of the song, the full band kicked in and Jerome traded his accordion for a guitar and they ended the song on a loud note. 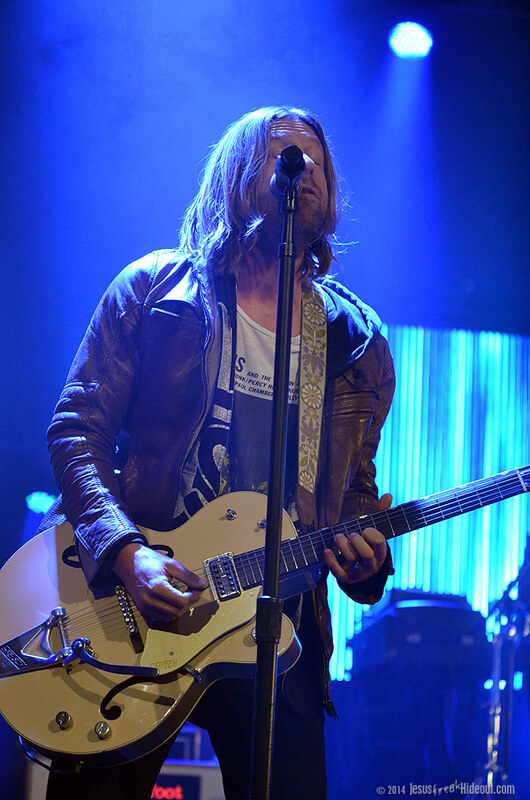 The equally-rocking "Dark Horses" was given a short acoustic intro before breaking out into full-on rock as well. 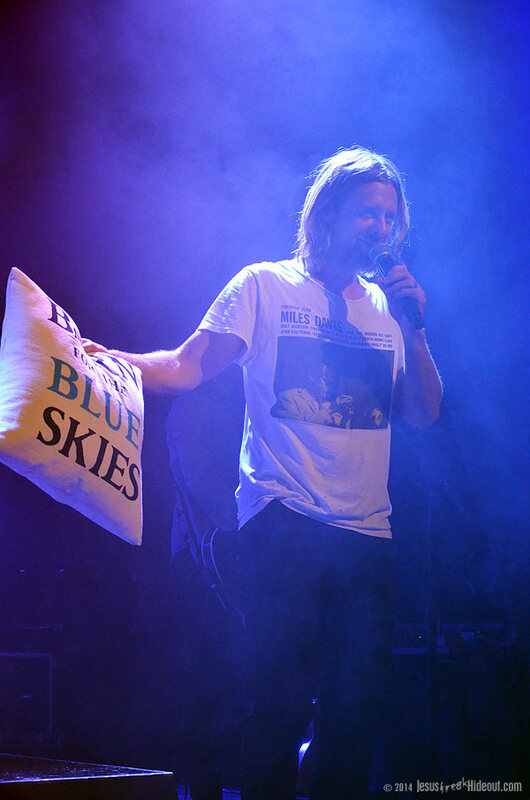 A fan in the audience held up a pillow that boasted part of the song's key lyrics, "Born for the blue skies," and Foreman blissfully held it up before tossing it back to the fan. 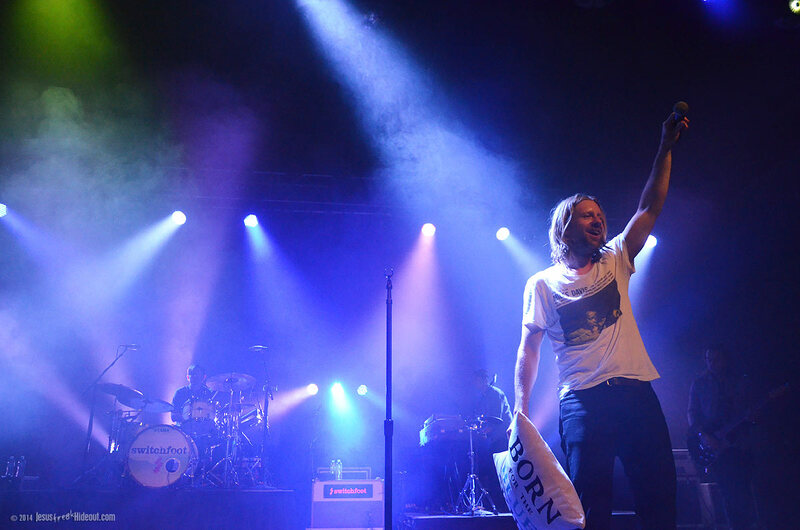 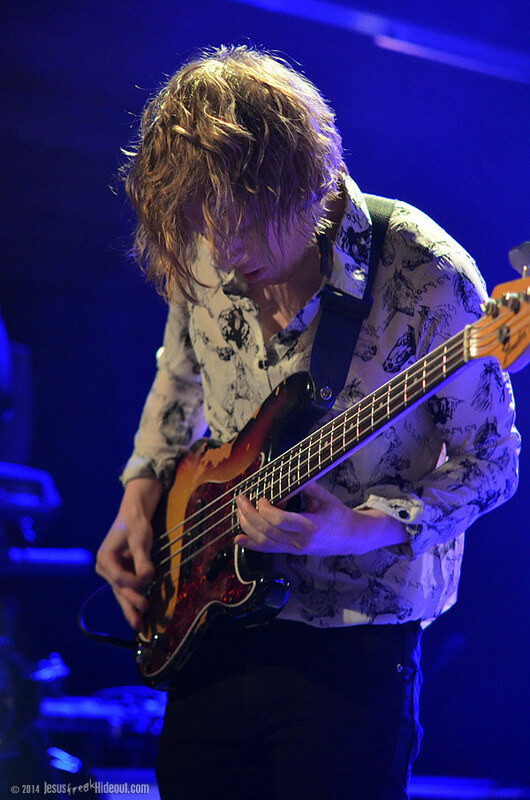 After "Horses" wrapped, he stood at the edge of the stage and encouraged the audience to sing along to the "Whoa-oh's" of Fading West's "When We Come Alive" and a boyish grin spread across his face as the audience shouted back in harmony loud and strong. 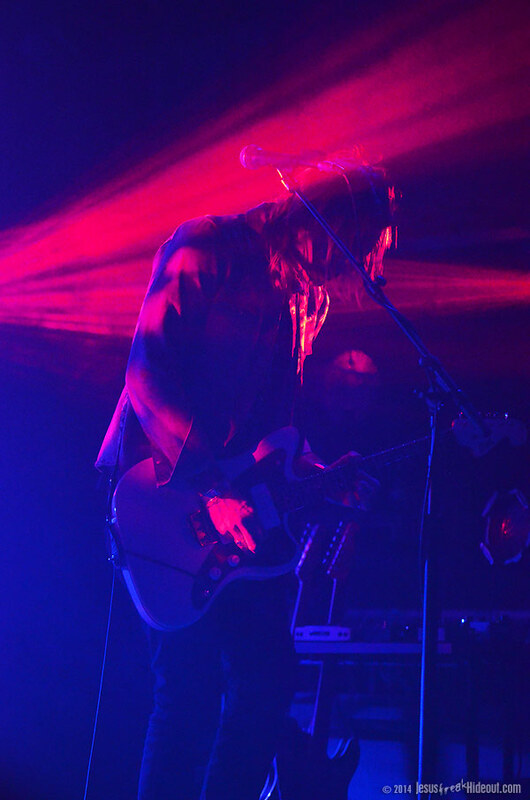 It was another great spine-tingling moment of the set. 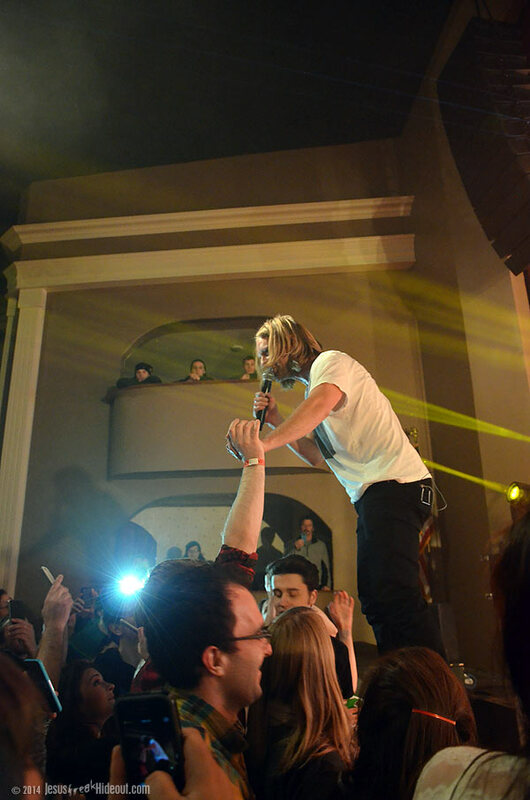 During the song, he waded through the audience, near the balconies on the side and then into the audience until he was at the back of the standing-room portion before the seats began. 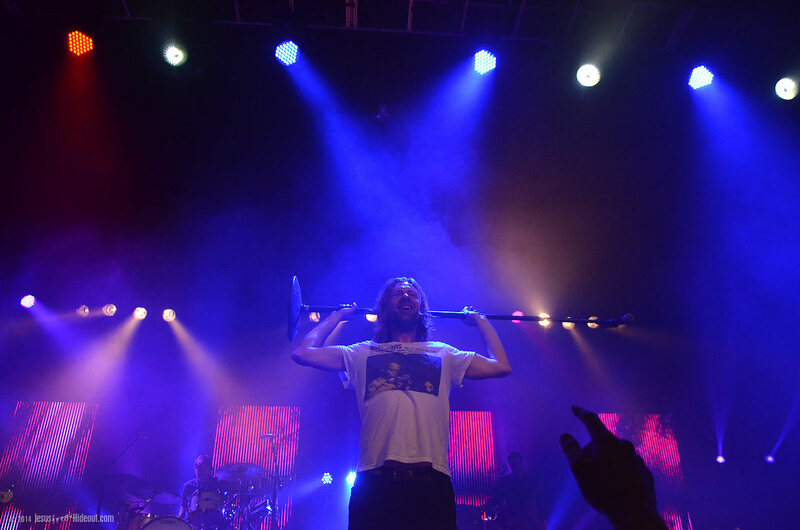 From there, he also started the next song, the band's single "Love Alone Is Worth The Fight," and then waded back through the crowd to the front again. 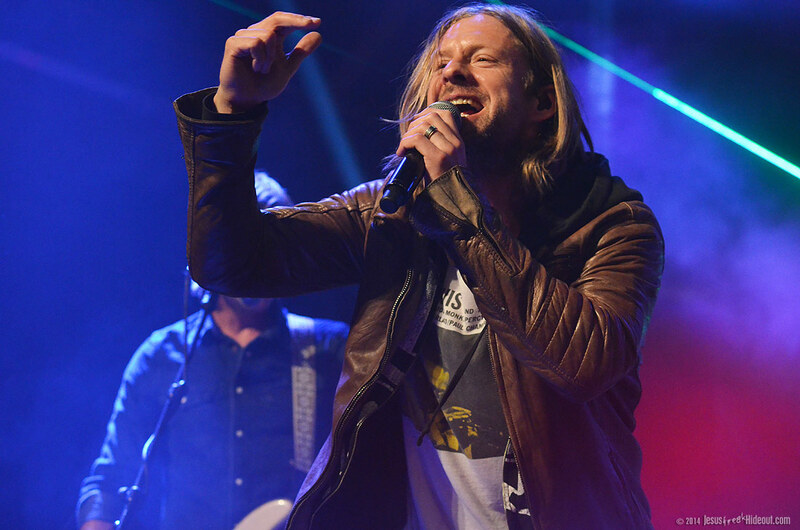 Afterwards, he invited the audience to dance to the next song--even if they couldn't (and lumped himself into that group)--and then broke out another impossibly catchy anthem in "Let It Out." 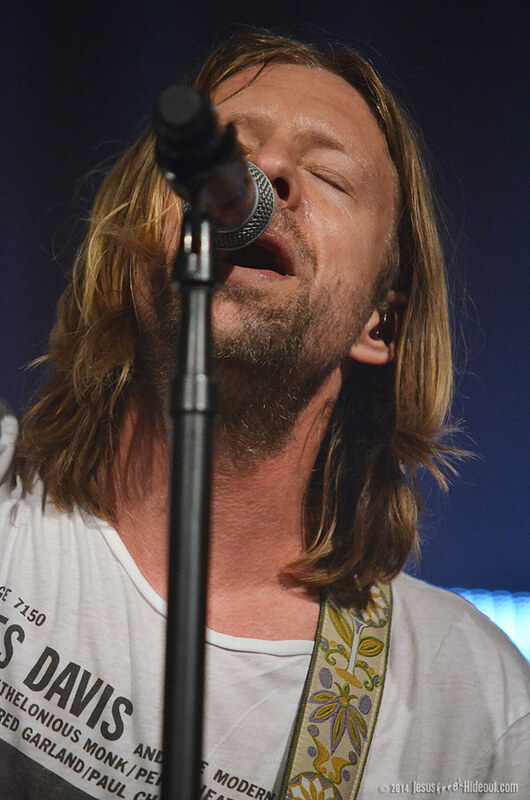 He explained it to be a song for letting loose and, while it's far poppier than the usual Switchfoot song, it translated wonderfully live. 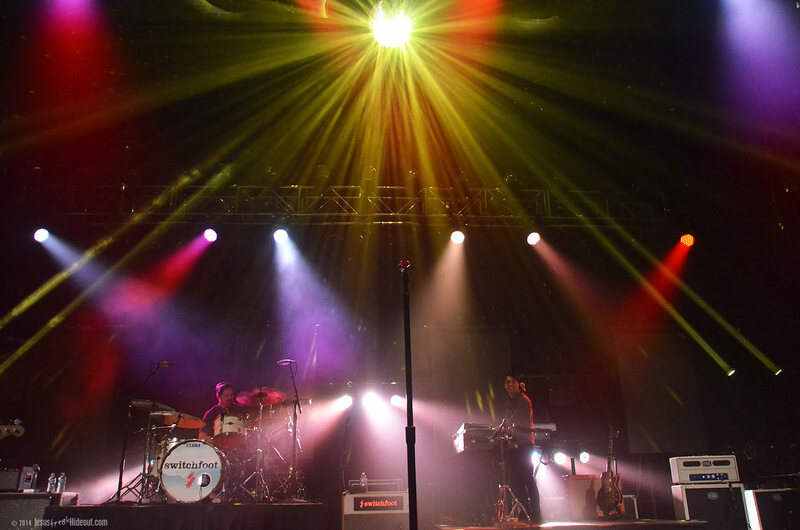 A disco ball that hung above Foreman bounced beams of light around the Sherman auditorium to add to the dancey feel of the song. 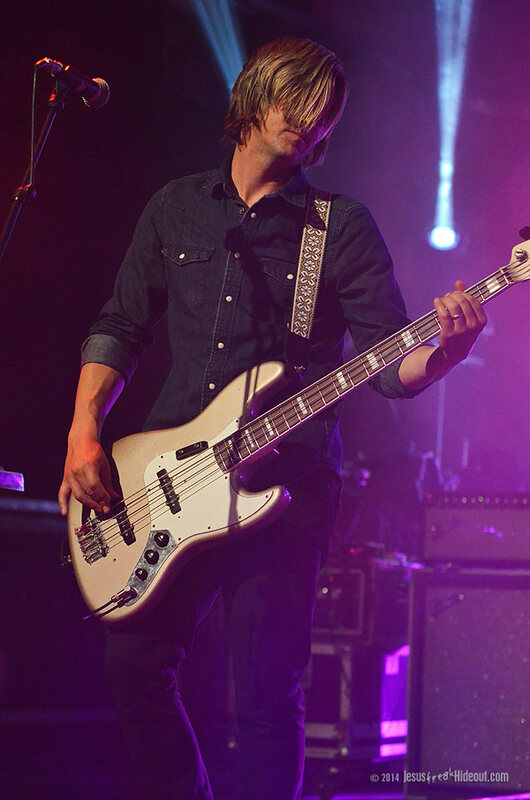 Jon then got back to business and mentioned his hero and inspiration John M. Perkins as an introduction to another fan favorite, the rocker "The Sound." 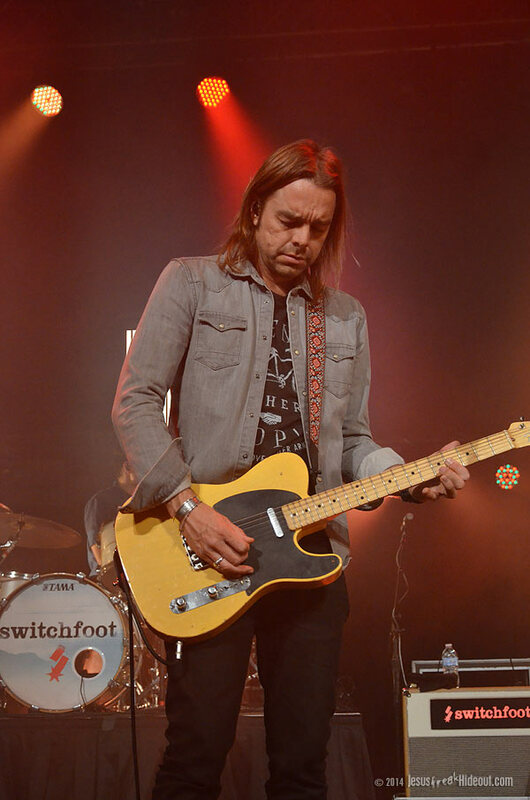 And it was a nice predecessor to the night's first finale, and Foreman talked about how the next song was about "the end" when he hopes to hear the words "Well done thou good and faithful servant." 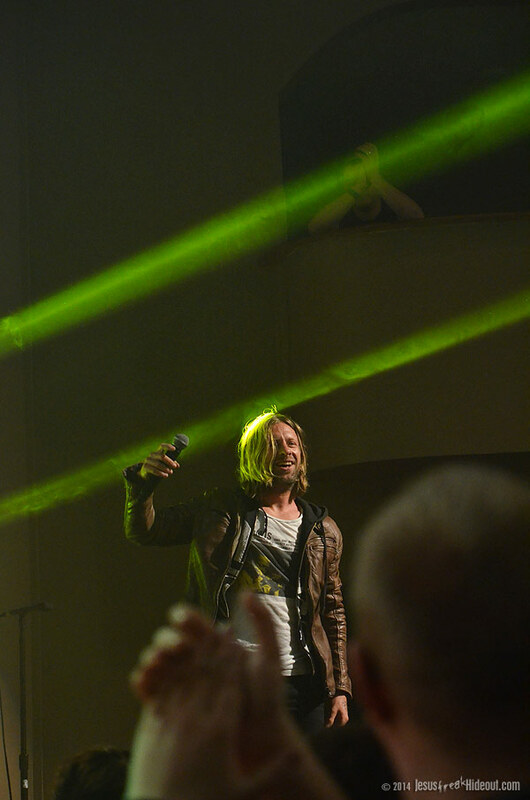 The emotionally beautiful anthem "Where I Belong" served as the set closer perfectly, singing out our longings for heaven. 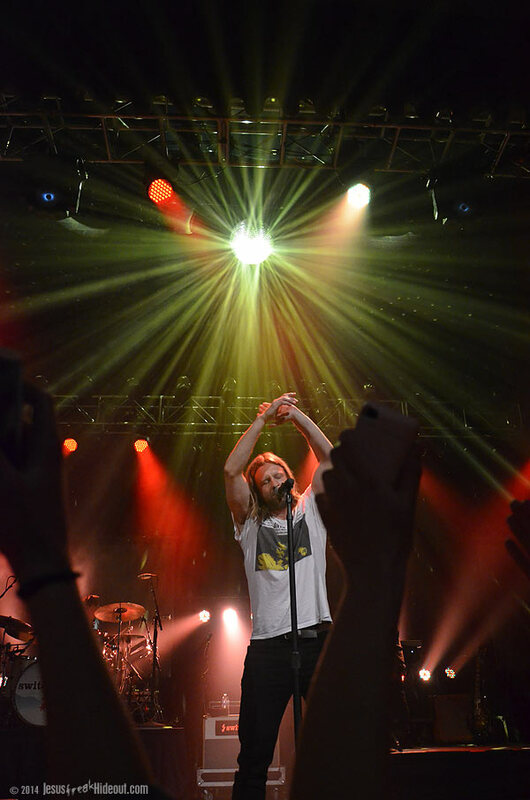 The guys waved goodbye and walked off the stage, leaving the audience in darkness, chanting for "One more song." 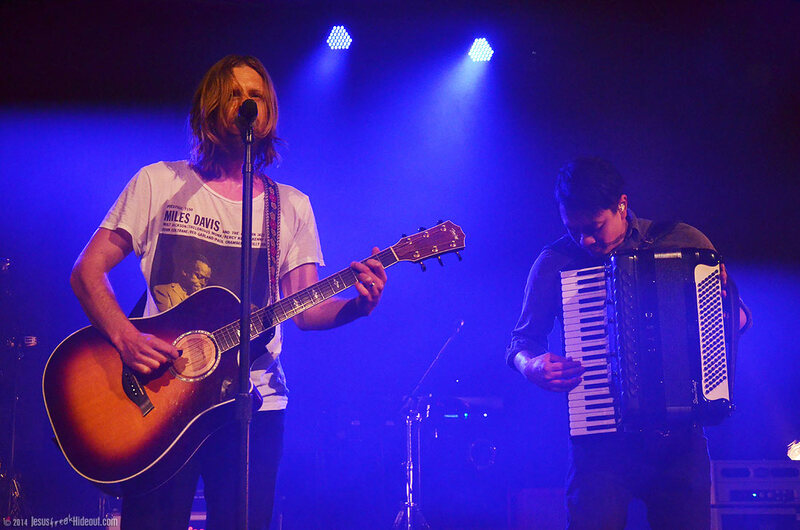 They then returned after just a moment and Jon asked if it were okay to play two more songs. 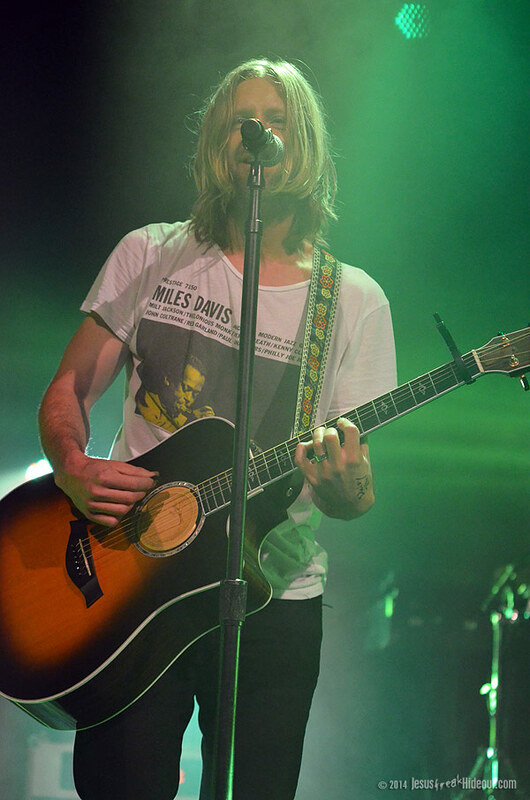 He stated that the next song was one they've never played before -- "Back To The Beginning Again." 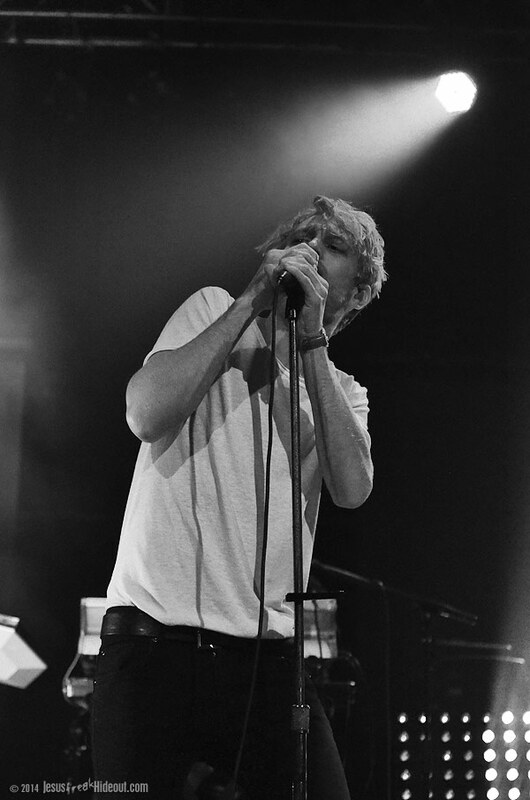 However, a quick YouTube search reveals other live performance examples, even as far back as late 2012. 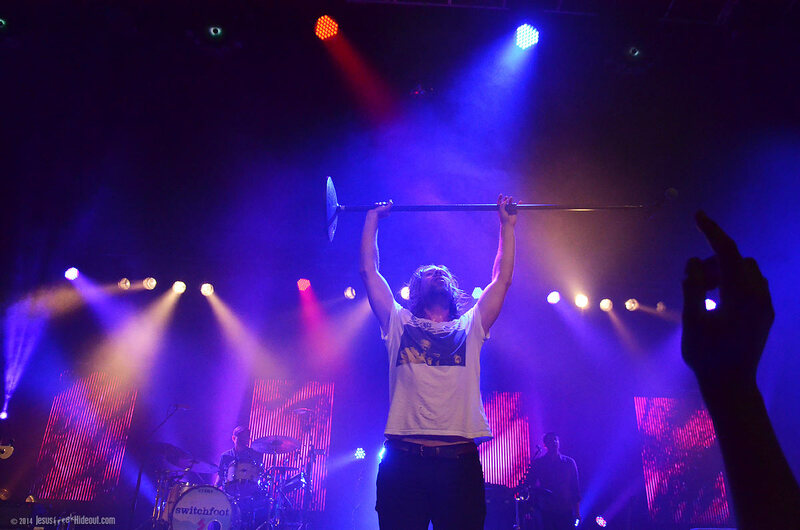 Perhaps it was the first time they'd played it live on this tour, but regardless, the feeling of exclusivity we felt just made the moment in the set more special. 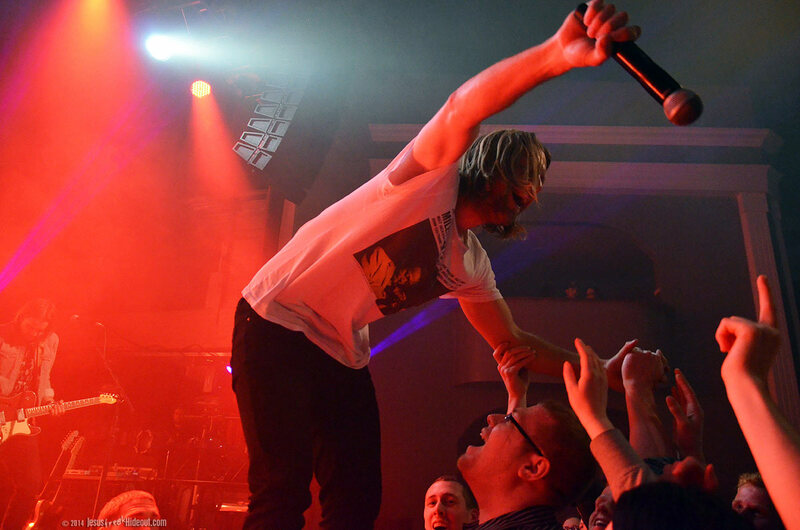 To close, Switchfoot performed another cut from The Beautiful Letdown--which actually first appeared on their 2000 album, Learning To Breathe--"I Dare You To Move," and it was a nice send-off for the night. 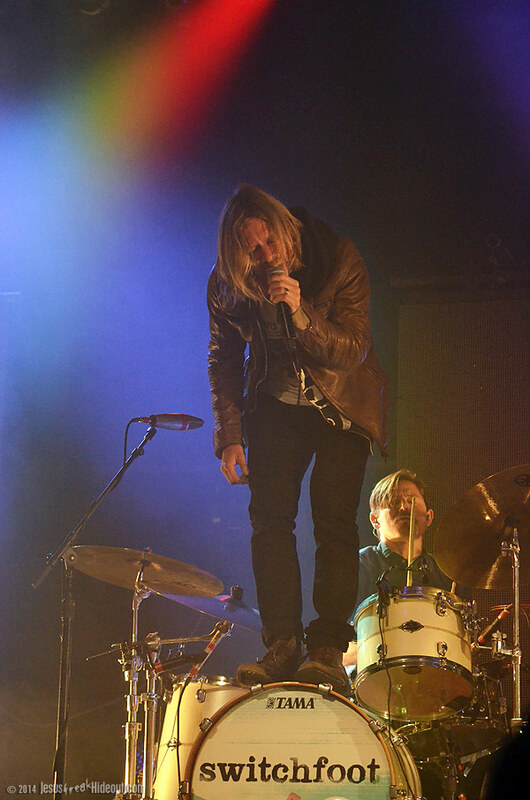 Short Clip of Switchfoot Performing "Back To The Beginning Again"
Unfortunately, this "Spring" evening was so painfully cold outside that Jon Foreman's spontaneous "after show" didn't happen, and the fans dispersed as soon as the venue was ready to close up. 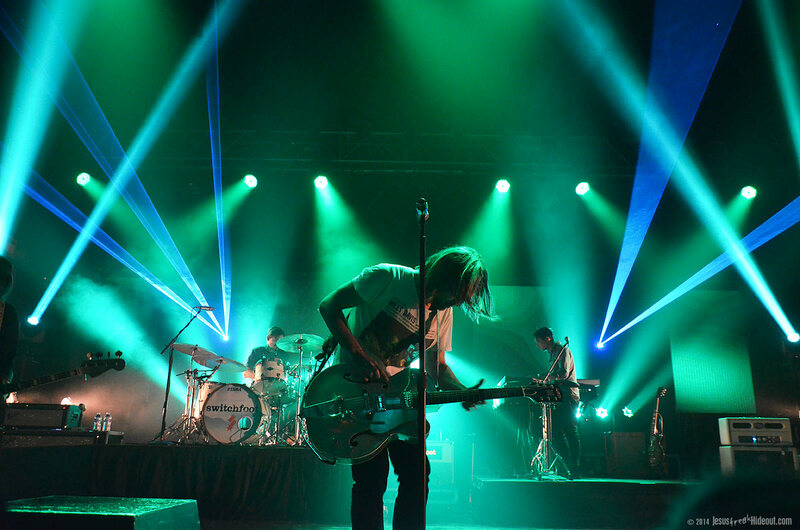 The Fading West Spring Tour is a solid night of pop music. 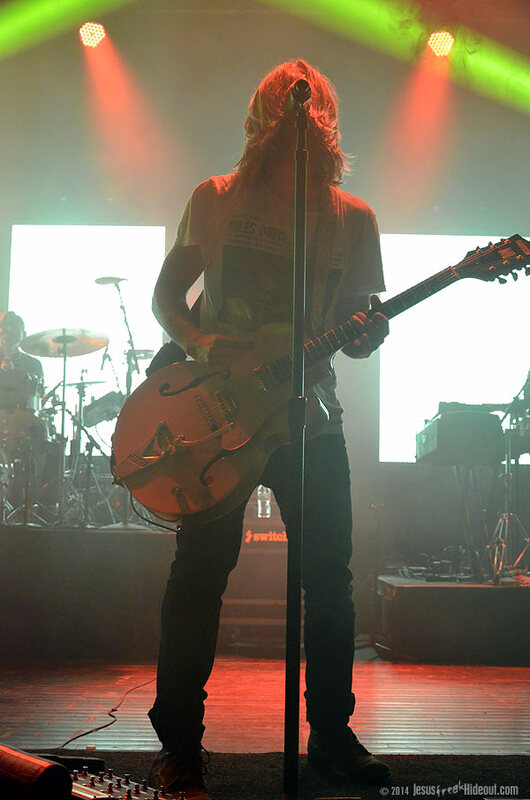 While I enjoyed The Royal Concept's set (more so before delving into the lyrics the following day), I do recommend those who attend the tour to either check the band out first online or look deeper into the content of their songs before picking up the CD at the show. 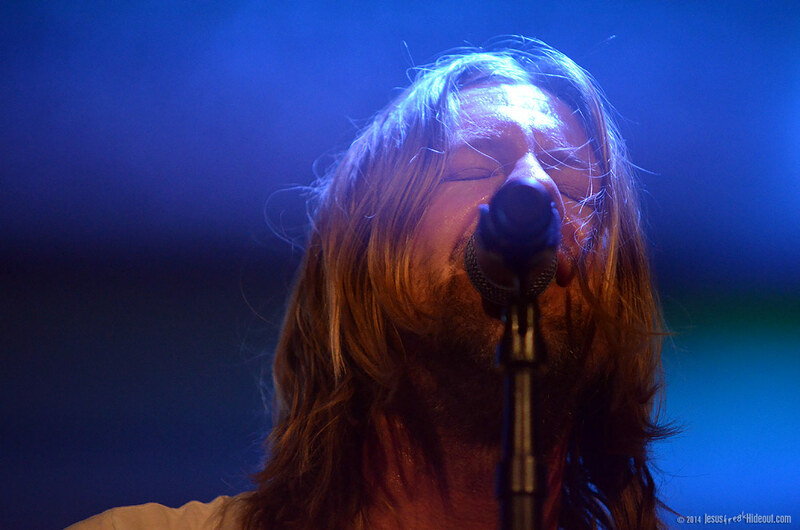 But obviously, it all depends on the listener's personal value of lyrical content. 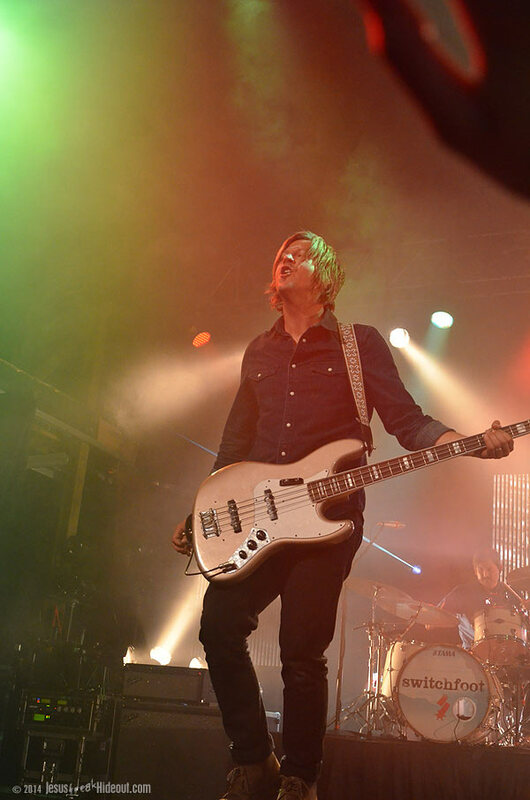 It's far from the worst you could hear from a band of course, but they do seem to lack the lyrical substance of a band like Switchfoot. 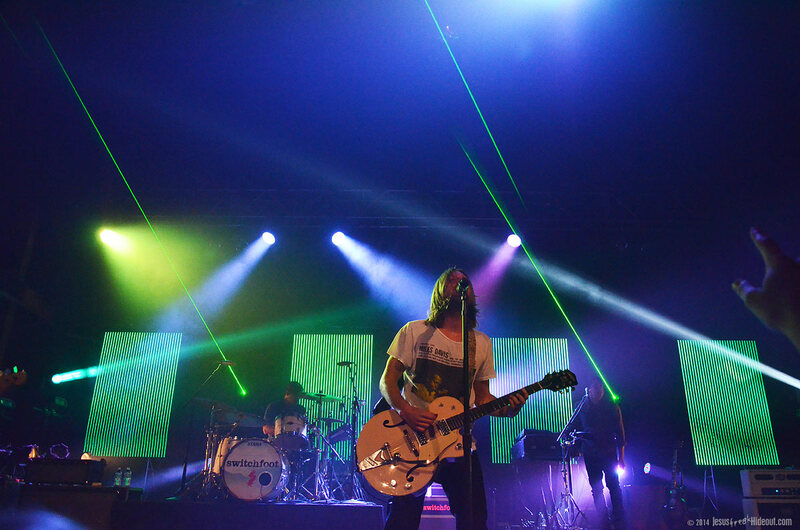 Aside from that minor setback, it really is a fantastic show and one I'd jump at the chance to see again as well.